MAPUTO, Mozambique -- Sitting outside her home with a thatched roof made mostly of reeds, Maria Amelia, 46, was preparing to take her first-ever HIV test. She was slightly anxious and made an admission that explained why. "Honestly I've never used [a condom] before. I cannot lie to you," she told The Huffington Post last month through a translator in Boane, a district of Maputo province in southern Mozambique. As World AIDS Day is commemorated Monday, Amelia is one person who illustrates the need for HIV and AIDS awareness. She said she hadn't had access to condoms previously and was receiving her first-ever HIV test through a free door-to-door program administered by Aconselhamento e Testagem em Saúde na Comunidade (ATSC), a program operated by the government. It receives support from Jhpiego, a nonprofit health organization that is affiliated with Johns Hopkins University and provides services in developing countries. The initiative is one of many ways HIV services are physically being brought to people's homes, encouraging proactive measures in a culture in which prevention and health care isn't a top priority, experts say. 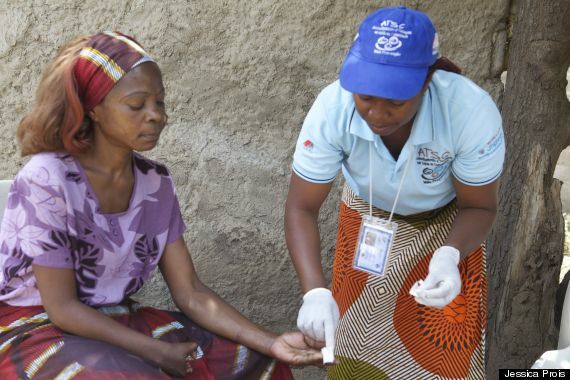 Maria Amelia, 46, receives her first-ever HIV test, offered through a door-to-door service in Maputo, Mozambique. Mozambique has one of the highest HIV and AIDS rates in the world at 11.5 percent among adults ages 15 to 49, according to the World Health Organization. The country's HIV services are funded by the Mozambican government, nongovernmental organizations, and countries including the U.S., which provides money through the President's Emergency Plan for AIDS Relief. Amelia, who was separated from her husband and has a son, pointed out that there is a lack of awareness about the issue in Mozambique. She listened intently as an ATSC health worker educated her about HIV prevention and provided an overview of the test. The worker showed her a photo book depicting ways HIV is contracted and preventative measures she could take. A health worker sterilized equipment taken out of a backpack and gave her a test by drawing blood from her finger. Her results would be available 15 minutes later. 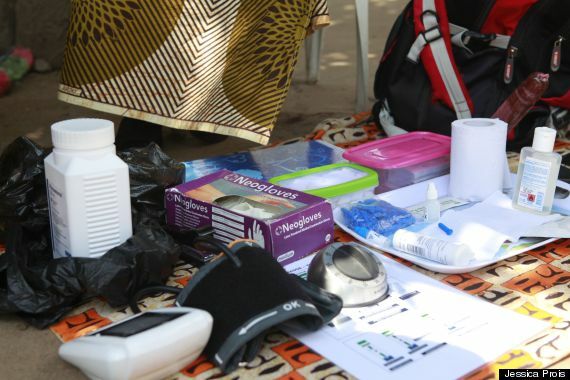 Health workers go door-to-door with HIV testing kits and counseling materials in Maputo, Mozambique. The ATSC team would go on to visit other households after Amelia's, all of which had consented to an HIV test. Alfredo Elias Macicame, an ATSC field officer overseeing the test, said his organization works with community leaders to set up home visits. 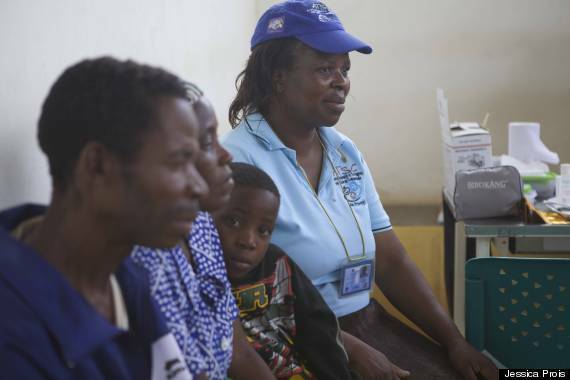 Jhpiego has tested more than 1.2 million people for HIV and offered counseling as well since 2008. "We build trust. That's how people let us into their homes," he said. As Amelia waited for her test results, she received training that included instruction on how to use a condom. After the time elapsed, she learned her HIV status. Although the government did not allow her to share the results with media, she was all smiles and said: "It's very nice to know about my status now. I'm so happy I know the results." Irondina Tomas received her HIV test results, just days after learning that her husband, Lucas Oliveira, had tested positive. She, too, tested positive, she told Huffington Post last month at a hospital in Boane, Mozambique. The silver lining was that their 6-year-old son, Neilito, was negative, she said. Oliveira said as soon as he got the results of his test -- the first he'd taken in his life -- he immediately had his wife and son go to the clinic as well. "After I was tested I wanted to rapidly tell my wife so she would get tested and safeguard our son. Thank God he's not infected," Oliveira told HuffPost through a translator. Lucas Oliveira, Irondina Tomas, and their son, Neilito, discuss their HIV test results at a hospital in Maputo, Mozambique. Oliveira and Tomas tested positive. Neilito tested negative. The rate of HIV transmission from mother to child is 15 to 45 percent, the World Health Organization reports. The family's relief quickly turned to practical discussion at Boane Hospital, where they received the diagnosis, as they discussed with hospital staff the treatments available and said they understood HIV is not a death sentence. "I'm ok. All I want is to be treated and get antiretroviral treatments," Oliveira said. Antiretroviral therapy (ART) involves taking at least three antiretroviral (ARV) drugs, aimed at suppressing the HIV virus and preventing the progression of HIV to AIDS. Over the past decade, providing antiretroviral therapy for poor and middle-income countries saved an estimated 4.2 million lives, according to WHO. But Mozambique faces many challenges, such as patients who don't keep up with prescribed ARV usage, experts say. There are other roadblocks as well. In June, Inter Press Service reported that while about one-third of the people who have HIV are on ARV therapy in Mozambique, the country experiences periodic shortages of the drugs that have detrimental effects. The shortages are caused by challenges with procurement, distribution and infrastructure in the impoverished country, Jose Enrique Zelaya, head of the Joint United Nations Programme on HIV/AIDS (UNAIDS) in Mozambique, told the outlet. "Basically, the problem lies in poor planning from the health ministry and in the process of distribution according to demands," Zelaya said. The Mozambique Ministry of Health did not respond to a request for comment. Oliveira, who works as a farmer, said he is appreciative that ATSC will deliver drugs to him once a month. He said he would not have known about resources available or the gravity of the issue if a co-worker hadn't told him about getting tested. "This treatment, I consider it a family issue -- protecting my family," he said. "Now I will convince friends to get tested, too." Jessica Prois reported from Mozambique on a fellowship from the International Reporting Project.